As Mexico moves further through World Cup 2018 qualifying, let’s take a look at one player that the opposition will definitely need to keep an eye on: Carlos Vela. The 27-year-old has been playing in the top leagues of Europe for the majority of his career, and now he’ll be hoping to help Mexico take another step toward qualifying for their seventh straight World Cup. Born in Mexico, Vela was almost immediately entrenched into football. After spending time with his local club in Cancún, the winger joined Mexican powerhouse Chivas Guadalajara’s youth academy in 2002. He would remain with Guadalajara for just over three years, but would never make a first team appearance. Due to impressive performances with the Mexican Youth National Team, Vela caught the eye of several European clubs, including Arsenal. The Gunners signed Vela for a reported transfer fee of €1 million during the 2006 Winter Transfer Window. Due to work permit issues, the Mexican would spend his first half season of European football with Celta de Vigo, but once again, he would not make a single appearance for the club. In what would become a theme for Vela during his time at the Emirates, Arsenal loaned him out once again for the 2006/07 campaign. This time, the teenager was sent to the Spanish second division with Salamanca. His performances with the Charros sparked optimism for Arsenal fans as he became a key part of the Spanish club’s attack. He would make 31 appearances for Salamanca, scoring eight goals along the way. Despite the praise from the boss, Vela would spend the next season on loan once again due to work permit issues. His next stop was to La Liga’s Osasuna. 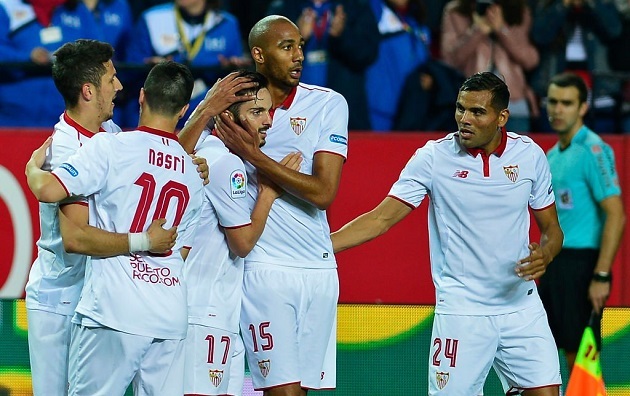 While he was unable to replicate his eight-goal tally from the previous season, Vela was still able to make 33 appearances in Spain’s top flight while contributing three goals and four assists. Osasuna would narrowly escape relegation that season, finishing just a single point ahead of Real Zaragoza for the final safe spot. Vela was finally able to join Arsenal’s first team for the 2008/09 season. His displays in Spain, and with the Mexican National Team gave Arsenal fans hope that he could become an exciting part of the attack. Things didn’t exactly go to plan. Over the next two-and-a-half seasons, Vela would start just three Premier League matches. Altogether he would end up making only 29 league appearances for the Gunners, but, on the bright side, he was able to make his European debut in the Champions League during the 2008/09 campaign. His most productive match for the Gunners actually came in a two-goal performance against Braga in the historic competition. After failing to secure a consistent spot in Wenger’s first team plans, Vela was once again sent on loan for the second half of the 2010/11 season. West Bromwich Albion represented the latest stop in the Mexican’s journey around Europe. In just eight appearances for the Baggies, Vela scored twice, and also assisted one goal. The next season would prove to be the turning point in Vela’s floundering European career as Arsenal sent him on loan to Real Sociedad. Sociedad seemingly provided the spark that the winger so desperately needed as he recorded a career-high in goals (12) and assists (seven). He even managed to score against Barcelona in a narrow 2-1 defeat. His wish became reality as Sociedad agreed a reported €3 million fee for his services on a permanent basis. Vela almost immediately made that price tag look like a bargain as he somehow managed to improve on his breakthrough campaign the previous year. 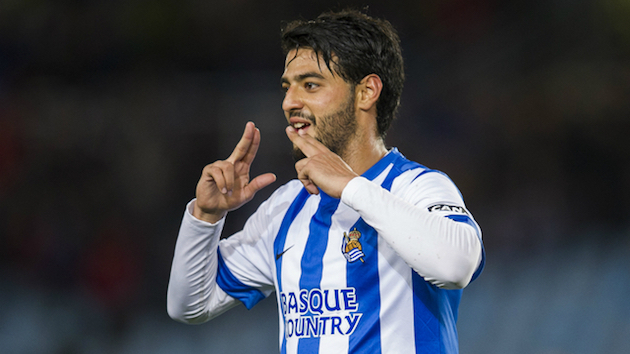 Out of the team’s 38 league matches, Vela would appear in all but three. Once again, he would set new career-highs in goals (14) and assists (nine). His amazing performances helped to push Sociedad all the way to Champions League qualification as they narrowly edged Valencia for the fourth spot in the table. Sociedad’s time in the Champions League was shortlived, however, as they crashed out of the group stage without winning a single match. While they struggled in Europe, Vela thrived domestically. His dynamic performances continued as he started 35 times for the club, and set yet another career-high in goals (16) and assists (12). Against his former club Celta Vigo, the winger pulled out a four-goal night that included this game-winner. Alongside Antoine Griezmann, Vela and Sociedad looked like a club set for bigger things. Sadly, the French striker left for greener pastures during the 2014 Summer Transfer Window joining Atlético Madrid. So far, things have worked out pretty nicely for him there. Things have not gone so well for Sociedad. Since Griezmann’s departure, Vela has been unable to live up to the heights he met during the previous two seasons. Sociedad haven’t finished higher than ninth, and they’re currently on their third manager in three seasons. 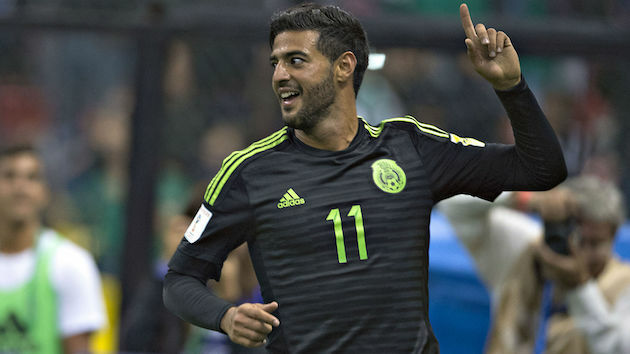 Vela’s time with the Mexican National Team hasn’t always been smooth sailing. After leading the U17 National Team to victory in the 2005 World Championships, fans had no reason not to expect the teenager to become a star on the senior level. 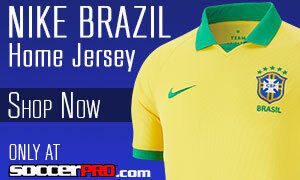 He would make his first international appearance during a 2007 friendly against Brazil. His first major tournament for El Tri was the 2009 CONCACAF Golf Cup, but an injury in the opening match forced him out until the semifinals. During that match against Costa Rica, Vela would end up scoring the winning penalty to send Mexico to the finals. In that final match, Mexico absolutely battered the US 5-0, with Vela scoring the third goal of the match. At the 2010 World Cup in South Africa, Vela would make just two appearances as injuries once again plagued his time with the national side. Later that year, Vela was handed a six-month ban from the national team for his alleged involvement in a party after a match against Colombia. Since then, the winger has refused call-ups for the London Olympics and World Cup Qualifying matches. He was also not a part of the 2014 World Cup squad. In 2015, he returned to international action as a member of the Gold Cup squad. Vela started Mexico’s first five matches, but a yellow card suspension ruled him out for the final against Jamaica. Mexico would go on to win the final 3-1. While he’s typically deployed on the right wing, Vela can also line-up as a striker if called upon. When he’s in-form, the 27-year-old can be lethal cutting inside from the flanks, and he’s proven that he can setup goals for his teammates.